Solihull, UK, 28 September 2016: Land Rover has revealed the New Discovery seven-seat SUV by breaking a Guinness World Record for the largest LEGO structure ever built. 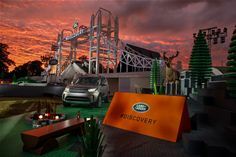 Long-term Land Rover Discovery owners Bear Grylls, Sir Ben Ainslie and Zara Phillips took part in the dynamic live reveal of Land Rover’s most versatile model around a 13-metre high LEGO version of London’s Tower Bridge. The New Discovery embodies Land Rover’s drive to go Above and Beyond, combining British desirability with an unstoppable spirit of adventure. It is highly desirable with unrivalled capability and technology like no other. Everyday ingenuity has been at the heart of the Discovery for the last 27 years, with more than 1.2 million customers to date. The new Discovery is for the digital age. Ingenious technology keeps your family safe, connected and confident on all surfaces, all terrains and in all weathers to ensure your destination is reached. The reveal set was made from 5,805,846 individual LEGO bricks, breaking the previous Guinness World Record by 470,646 pieces. Laid end to end, the bricks would stretch for almost 200 miles, or from Tower Bridge in London to Paris. Led by the UK’s only LEGO Certified Professional, Duncan Titmarsh, it took five months for expert LEGO Master Builders in the UK to construct the incredible Tower Bridge structure. It was erected in the grounds of Packington Hall, Warwickshire, UK – close to Land Rover’s Solihull plant, where New Discovery will be produced. As part of the dramatic reveal sequence, British adventurer Bear Grylls appeared in typically exciting fashion by abseiling from the top of the huge Tower Bridge installation, through the open drawbridge and onto the stage beside the New Discovery. The finale was Land Rover BAR Team Principal Sir Ben Ainslie driving his sailing team through 900mm-deep water under the bridge – demonstrating the unrivalled capability and versatility of Land Rover’s new SUV. Sir Ben towed a LEGO replica of the Land Rover BAR boat, a 186,500-brick meticulous model of the boat that will challenge for next year’s America’s Cup. The model of Tower Bridge was flanked by two LEGO ‘Discovery Zones’ celebrating 27 years of Land Rover Discovery heritage. An Equestrian Zone, hosted by accomplished rider Zara Phillips, featured a typically British picnic scene made entirely from LEGO bricks. The Bear Grylls Adventure Zone included a LEGO fire and boulders to represent a scene from a typical mountain exploration. New Discovery represents the next step in Land Rover’s journey of transformation from cogs to code and is designed, engineered and manufactured with the help of some of the 1,300 talented young engineers currently on the company’s leading training programmes. Jaguar Land Rover is one of UK’s leading recruiter of graduates and apprentices: 3,000 have joined in the past six years and 400 new recruits have just started on the 2016 intake.